Damascus, or pattern welded, steel was a term used by several Western cultures from the Medieval period onward to describe a type of steel used in swordmaking from about 300 BC to 1700 AD. These swords are characterized by distinctive patterns of banding and mottling reminiscent of flowing water. Such blades were reputed to be not only tough and resistant to shattering, but capable of being honed to a sharp and resilient edge. Today, the term is used to describe steel that mimics the appearance and performance of Damascus steel, usually that which is produced by either crucible forging or pattern welding. The original method of producing Damascus steel is not known. Due to differences in raw materials and manufacturing techniques, modern attempts to duplicate the metal have not been entirely successful. Despite this, several individuals in modern times have claimed that they have rediscovered the methods in which the original Damascus steel was produced. The reputation and history of Damascus steel have given rise to many legends, such as the ability to cut through a rifle barrel or to cut a hair falling across the blade, but no evidence exists to support such claims. A research team in Germany published a report in 2006 revealing nanowires and carbon nanotubes in a blade forged from Damascus steel. This finding was covered by National Geographic and the New York Times. Although modern steel outperforms these swords, microscopic chemical reactions in the production process may have made the blades extraordinary for their time. Some experts expect to discover such nanotubes in more relics as they are analyzed more closely. According to the journal Jom (member journal of The Metals, Minerals, and Materials Society), the art of producing the famous 16-18th century Damascus steel blades found in many museums was lost long ago. Recently, however, research has established strong evidence supporting the theory that the distinct surface patterns on these blades result from a carbide-banding phenomenon produced by the microsegregation of minor amounts of carbide-forming elements present in the wootz ingots from which the blades were forged. Further, it is likely that wootz Damascus blades with damascene patterns may have been produced only from wootz ingots supplied from those regions of India having appropriate impurity-containing ore deposits. Damascus steel is made by combining several different steels, heating, beating, folding, repeat, repeat, repeat...... The skill of the blacksmith will determine the end result. Good quality Damascus steel billets will cost more than the knives this guy was selling as a finished knife. You will often hear how many layers the steel has. If you start with two types of steel, fold it - you now have 4 layers, fold it again - 8 layers, fold it again - 16, 32, 64, etc. Starting wit 6 types - fold it - 12, 24, 48, 96, etc. The steel is welded (blacksmith welding) each time the steel is folded to form one solid piece. The number of layers in the final billet will be dependent on how many folds have been made. Over 1,000 is not uncommon. The pattern will be determined by skill and types of steel used. The patterns are then brought out with acid. The different steels will react at different rates. Around 2800, 2700 BC the first uses of meteoric iron in Egypt. 2500 BC the first iron tools are used in Anatolia and Mesopotamia. Around 2000 BC, the Hittites living in the east of the present Turkey collect the iron ore and melt it in small furnaces. 1200 BC is the ending period of the Hittites peoples, probably the blacksmiths spread in the neighboring countries and share their knowledge. From 1500 to 1000 BC the first iron tools and weapons production centers become very active in Greece, Cyprus, Crete and Macedonia. In South India melted iron is extensively used. Around 1000 BC the Greeks start to quench iron to improve the cutting characteristics of their iron weapons. From 1000 to 500 BC the Hallstatt civilization, in central Europe (present Austria area), is leading the iron period. Around 600 BC, the Persia and the Etrusquia blacksmiths know how to fire weld iron. Starting around 600 BC the India blacksmiths use the carburization technique and repeated hammering sequences to improve the iron qualities. In China, about 1000 BC, knowledge of iron-working techniques reached the country from the West. Using their kiln pottery curing knowledge the Chinese smiths produce the cast iron. The use of the iron spreads all over Europe with the spread of the Celt civilization. Birth of the Wootz in South India. In Europe, birth of the steel. The techniques used to produce steel could be based on iron selection or on carburization. The fire welding technique is used to produce iron weapons with a steel cutting edge. Birth of the Pattern Welded Steel with twist and chevron patterns in sword blades. The Wootz is extensively used in India. The "Merovigiens" use the pattern-welded steels for both their esthetical and mechanical properties. The "Merovingiens" and the "Carolingiens" use the pattern-welded steels. Pattern-welded steels are extensively used in Europe. The "Normands" (Vikings) use pattern-welded steels for their weapons. Unceasing usage of the pattern-welded steel in Europe. Kris are made in Indonesia. Wootz steel is also produced in Turkmenistan and Uzbekistan (Ph.D. from Ann Feuerbach). The use of the Pattern-welded steels start to decline. 1095 is the first crusade year. In Europe the welded-pattern steel is disappearing. No more trace of Pattern-welded steel. The last crusade end up in 1270. During the XIV th Century the size of the furnaces increases, it's now possible to produce cast-iron with a powerful air blast and then to convert the cast-iron to steel. Pattern-welded steel is no more used. The use of the steel is growing. Re-birth of the Pattern-welded steel in Europe, in Russia the blacksmiths produce the Bulat. The Pattern-welded steel is mainly used to produce gun barrels in Turkey. 1784 the "pudding furnace " is discovered in England. 1795 first scientific lectures about the Wootz steels (Mushet from England). In 1803 is published an article from Jean François Clouet in the "Journal des Mines" : " Instruction sur la fabrication des lames figurées ou lames dites Damas "
Faraday in England and Bréant in France study the iron alloys. During 1824, Bréant explains the chemical and the crystalline composition of the Wootz. In Russia Anosoff (1841-43) and after Tchernoff (1860) are able to re-do the Bréant's experiments and to deepen his findings. 1855 the Bessemer and open hearth processes are used. 1865 the Martin process is discovered. 1900 The first electrical ovens are producing steel. 1918 Belaiew, a Russian Scientist, produce Wootz blades with a process using steel and graphite as raw materials. His experiments are duplicated by Von K. Harnecker in 1929. Starting in 1960, Cyril S. Smith, C. Panseri, Oleg Sherby, Jeffrey Wadsworth, Al Pendray, M. Sachse,W. Yater, Dr Verhoeven and some others re-start the scientific work about Wootz and pattern-welded steels. During 1973 William F. Moran (Bill) starts selling knives with Pattern-welded blade. 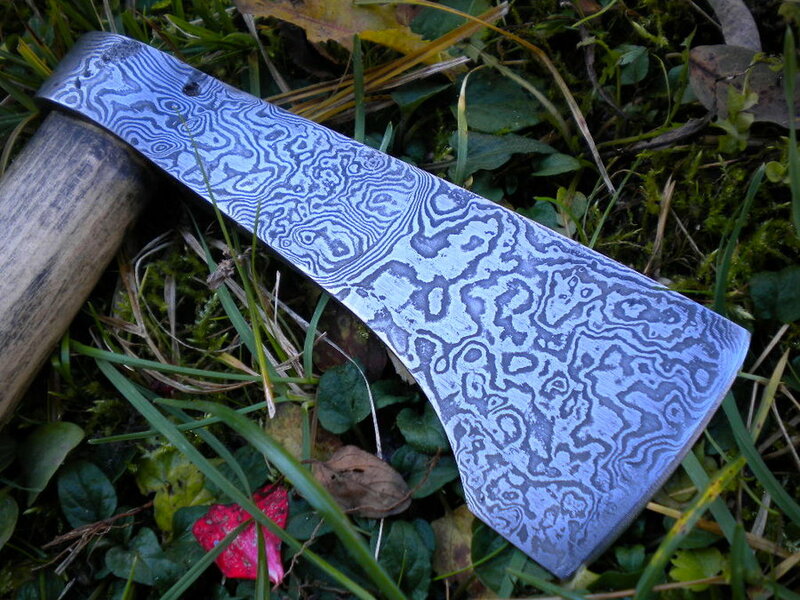 Starting from the States, the damascus steel spreads all over the world. With Damasteel the two give much different results. Ferric will result in a double grey pattern (dark and light grey pattern) on either a matte or polished finish. Makes the material look like carbon steel damascus. Muriatic will give a mirror/frosted finish on a polished finish and a lighter grey/grey pattern on a matte finish. Either can be used to very heavily etch then the material can be polished to give a stepped surface. 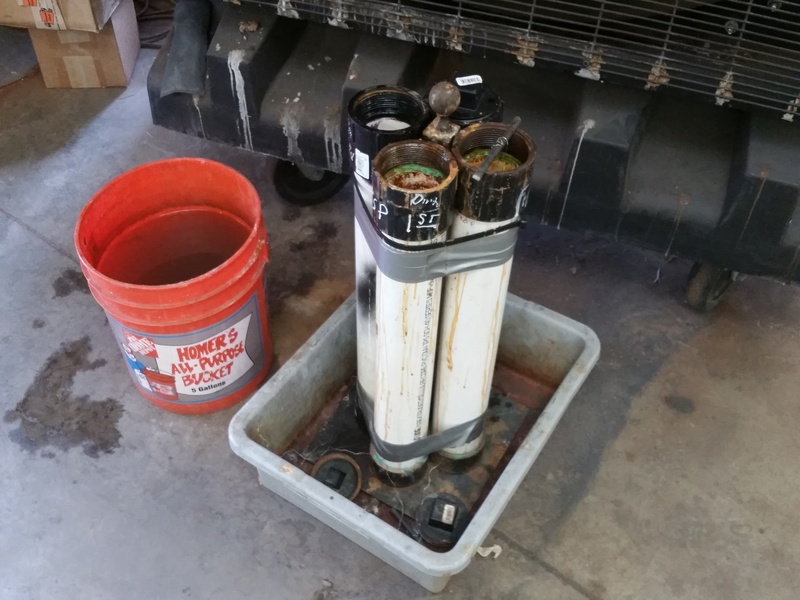 The etching tank setup was made with 3" x 24" PVC pipe, capped at both ends, bottom with a cap and the top with a threaded coupling. They were taped together and stood up in a plastic tube just in case of any spills.